By Jack Murray, C.L.I. And Jay L. Murray, J.D. ByJack Murray, C.L.I. And Jay L. Murray, J.D. A new trend is emerging in private investigative case assignment-defendant investigations on sexual abuse. For the first time, a nationally known private investigator and attorney at law combine forces to bring you the expertise and investigative techniques needed to win these types of cases for the defendant. 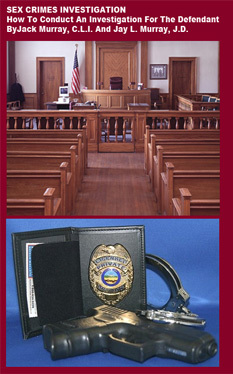 This text book covers both the legal aspects as well as the investigative aspects of these types of cases with step-by-step investigative techniques you can use to hand an attorney the evidence he needs at trial. The authors hand you twenty years of experience and expertize on handling these types of cases successfully. 8 1/2 X 11, 114 pages, with NAIS certificate issued in your name if NAIS member in Sexual Defence Investigations.